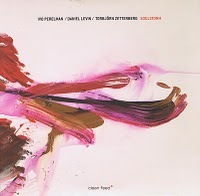 Tenorman Ivo Perelman arrived in Portugal for a series of gigs and a recording session in April of 2009. He was slated to appear with an interesting configuration: Daniel Levin on the cello and Torbjorn Zetterberg on upright bass. It all culminated in the newly released two-CD set of the three improvising in the spirit of adventure and discovery. The resulting release is dubbed (not inappropriately) Soulstorm (Clean Feed 184). This is concentrated, seriously intent music. The cello-bass-tenor combination gives the group sound a darkly expressive bent. All three get the chance to interact in depth and they succeed quite well in giving the music a spontaneous yet considered spin. Ivo clearly appreciates the chance to stretch out in such a context, and puts in some fine work. Daniel and Torbjorn respond with sometimes dense, vividly thick textures and a maelstrom of bowed and plucked sounds, sometimes building to a carpeted barrage of dissonance and energy. This is not a causal listen sort of set. It demands your attention. It rewards in kind with improvisatory flights the likes of which one seldom hears. If you put three other very good improvisers in their places (on the same instruments) it might be very good as well, but it would not sound like this. The three have put an indelible stamp of identity on the music. Those willing to work their ears as hard in response as they did in execution will be the beneficiaries of what makes improv so interesting these days.